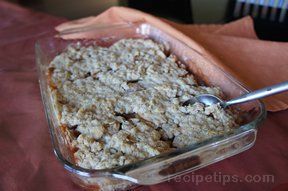 An crisp oatmeal topping over the soft and sweetened cinnamon apples is the perfect Autumn dessert. Served warm with a scoop of vanilla ice cream, everyone will enjoy it. 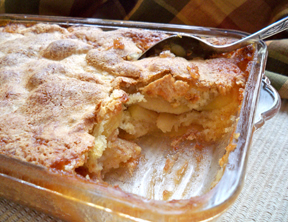 Mix sugar, cinnamon, nutmeg and flour and toss with the apples. Place in a 9x13 baking dish. Mix butter, brown sugar, flour and oatmeal until it forms a play-doh consistency. 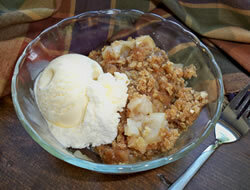 Crumble over apple mixture. I usually try to make sure all of the apples are covered. Bake at 350 F. for 45-50 minutes. Serve warm. NOTE: Will keep well on the counter with foil or in the fridge. "My apples are small, but delicious. I used them to make this crisp recipe. Loved the topping. 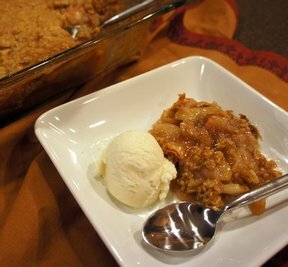 I like the same amount of apples to topping, so this was perfect for me."